THIS SET IS ABSOLUTELY AWESOME, BEAUTIFUL. From tip of spout to the end of handle it measures approx. 6 5/8 inches wide and base of teapot is approx. 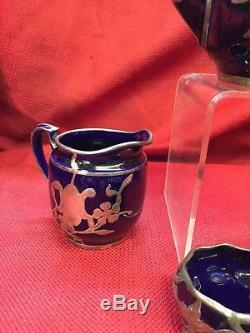 3 ¼ wide, 4 " tall without lid and approximately 5 1/8" tall with lid. 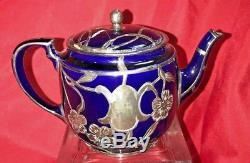 On inside of teapot there are 10 holes behind spout where tea would be strained. 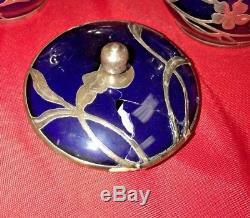 The lid is a silver showing signs of wear and has the only damage noted which shows a previous repair. 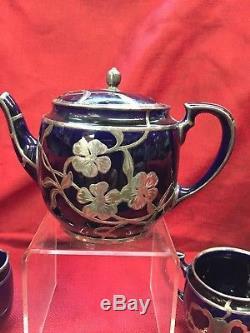 The teapot itself is very nice without any damage, it does not show any signs of cracks, scratches, chips or repairs that I can see. 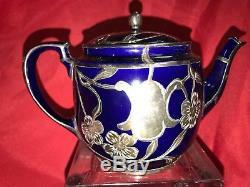 On the bottom of the teapot it bares the Lenox marking n green. 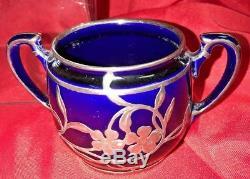 The creamer is also a beautiful piece! 3 ¾ inches from tip of spout to end of handle, and is 3 tall. The base diameter measures approx. This piece also has the thick silver design on it. It also bares the Lenox marking in green. 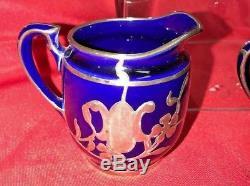 Overall this creamer does not show any signs of cracks, chips, scratches or repairs that I can see. The sugar bowl is also very adorable. 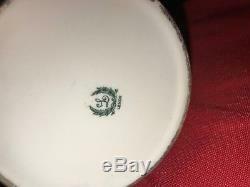 It has the Lenox marking on the bottom of the porcelain in green. 5 inches from end of one handle to the other. I dont see any signs of cracks, chips or repairs. Overall this entire set would be a wonderful addition to your collection! 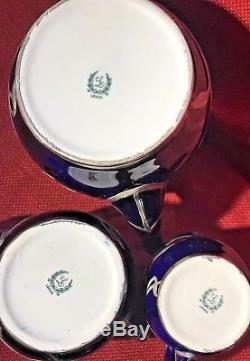 The silver mark (vase) is from DePasse Mfg. 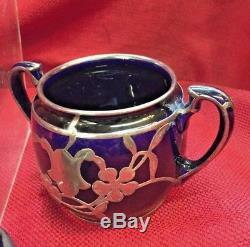 Please see photos and feel free to check out our other auctions for similar products. Although some items are New, IF INCLUDED Boxes may have slight blemishes or damage due to age of items. Please let me know what else you have your eye on.... Maybe we can make a deal! If you happen to receive a damaged item (rare) you MUST keep all packing materials and contact immediately. I cannot help what happens after the item/items leave this country. I do INSURE them however to the international facility. PLEASE look at photos carefully, you will receive EXACTLY the item or items in the photos unless otherwise stated. If there is a box in the photo it is included. If no box in the photos then probably there isn't a box, however that doesn't mean that sometimes I can't come up with at least the blue jewelry box (Olszewski items) if absolutely necessary, just ask. The black boxes seen in the photos (Olszewski items) are not included and are for photo purposes only. Feel free to ask questions about anything and I will respond as quickly as possible. All reasonable offers will be considered. We are trying to build our numbers. If there is any reason not to give all "5"'s please contact me I'm sure we can resolve it. FEEDBACK is as important to me as it is to you. I apologize for this and have adjusted sales prices to help to counter this for my buyers. Believe me I don't like this anymore than you do. 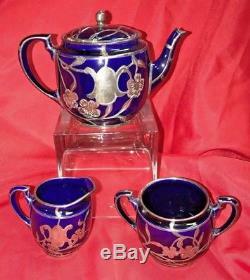 The item "Vintage LENOX COBALT BLUE and STERLING Silver COMPLETE 3 pc TEA SET" is in sale since Sunday, December 31, 2017. This item is in the category "Pottery & Glass\Pottery & China\China & Dinnerware\Lenox". The seller is "atravelnurse" and is located in Palestine, Texas.